Hey, young guys are not the only ones who can get drunk, high, and cause disorderly conduct. When it was announced that Christopher Walken, Al Pacino, and Alan Arkin would star in Fisher Stevens’ Stand Up Guys, a lot of people thought it just be the Hangover but with senior citizens. But the trailer shows us something that’s surprisingly unexpected. Walken, Pacino, and Arkin all star in Stand Up Guys, a film where Val (Pacino) reunites with his old pals Doc (Walken) and Hirsch (Arkin) to go an all-out bender which includes drinking, hard drugs, sexual encounters, and grand theft auto. The twist is that Doc has been hired to kill Val, and Val knows it. Talk about a who’s who of great actors. 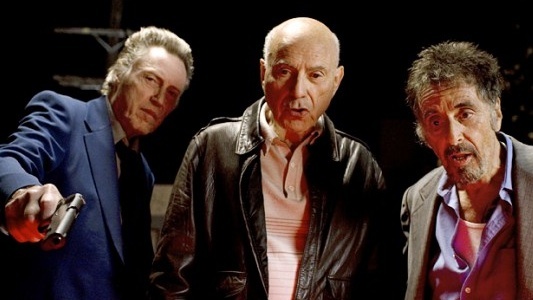 THR is reporting that the trio of Alan Arkin, Al Pacino, and Christopher Walken have joined the cast of a new action comedy, Stand Up Guys. Helmed by Fisher Stevens, the film follows a couple of criminals in the later stages of life—one having been hired to kill the other—who have one more wild night together involving stolen cars, brothels, and cop chases.